After head coach Mike Yeo and the Blues gutted their coaching staff by firing Rick Wilson, Steve Thomas, Ray Bennett and Ty Conklin in early May, rumors swirled that three of the replacements would come from the Blues’ AHL affiliate Chicago Wolves’ coaching staff. On May 24th the Blues hired longtime NHL assistant Darryl Sydor and now the trifecta is complete as the Blues have hired both Craig Berube and Daniel Tkaczuk. They have also found themselves a new goaltending coach in David Alexander. Berube was the head coach of the Wolves last season, leading the team to a 27-point improvement over their 2015-16 campaign. 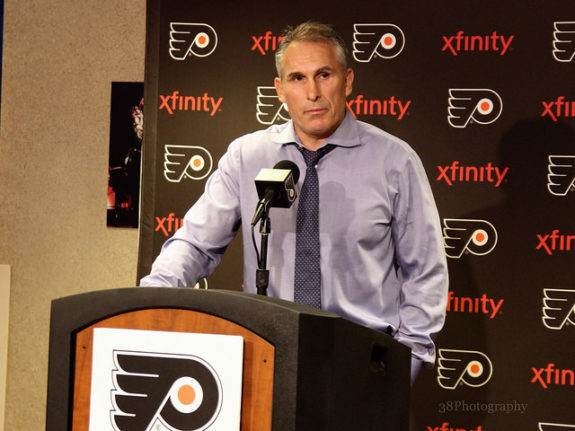 This is not Berube’s first NHL stint as he was Philadelphia’s head coach from 2013-15. The Flyers went 75-58-28 under Berube and he was fired after an opening-round playoff loss to the Rangers that went seven games. Before his first and only NHL head coaching gig, he spent seven years as either an assistant or AHL head coach. Last month the Blues hired former Blues’ Steve Ott and Barrett Jackman to coaching positions and I called attention to the fact that the Blues may have the grittiest staff in all the NHL, Berube aka “Chief” adds to that notion. During his playing days, Cheif threw fists in a staggering 410 fights, racking up a total of 3,149 penalty minutes. Berube played 1,054 NHL games, with Philadelphia, Washington, Calgary, Toronto and the New York Islanders. Blues’ prospect Tage Thompson called Berube one of his best coaches he’s ever had. “…the way he carries himself, what he demands from the players. You can see everyone respects him. When I came in, all the older guys couldn’t speak highly enough about him, and I got to witness it first-hand.” Thompson said. Tkaczuk was drafted 6th overall in the 1997 NHL Draft by the Calgary Flames. He played in only 19 NHL games and was mostly a minor league journeyman. During his career, he did have a stint in the Blues’ organization when he played for their former AHL affiliate, Worcerster IceCats, in 2001-02. Tkaczuk represented Canada at the 1999 World Junior Ice Hockey Championships, where he won a silver medal and led the team in scoring. Tkaczuk was named to the AHL’s All-Rookie Team the following season. While Tkaczuk is known by some as the worst draft pick in Flames history, he has found recent success in coaching, being discribed as a “players coach” and one who has received high praise from the Blues organization since his hiring in August of 2016. Outside of coaching Tkaczuk is president of IHockeyTrainer.com, a website where pro players give expert hockey advice, tips & drills to website members. 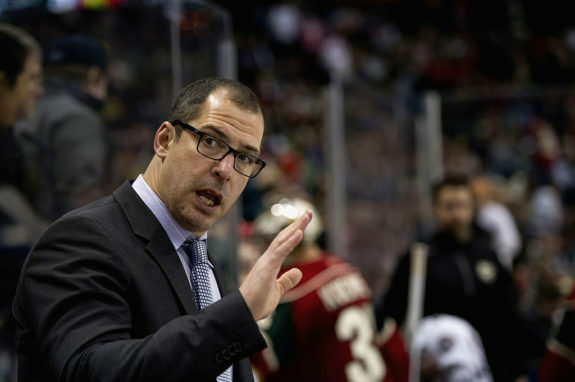 Sydor spent five years with Yeo with the Minnesota Wild and was an assistant on his staff with the Houston Aeros. Together they reached the Calder Cup finals in 2010-11. Sydor was a two-time All-Star and won two Stanley Cups in his 18 seasons as a player; with Dallas in 1999 and with the Tampa Bay Lightning in 2004. He also went to the Finals in 1993 with the LA Kings, in 2000 with the Stars and in 2008 with the Pittsburgh Penguins. He played in 1,291 NHL regular season games, tallying 507 points and had 56 points in 155 playoff games. Interestingly, Blues’ goaltender Jake Allen and Alexander are both natives of New Brunswick and have known each other since Allen was just 14-years-old. “It’s a perfect match. I think the timing is right for this … We have a great relationship on and off the ice and he knows me better than anyone. It’s crazy how we’ve re-connected in the NHL. It’s a pretty interesting and cool story.” Allen told the St. Louis Post-Dispatch. Alexander has spent the last four seasons as the AHL’s Syracuse Crunch goaltending coach. They advanced to the Calder Cup this season but fell to Grand Rapids in six games. Before his stint with Syracuse, Alexander coached goalies for five years at the University of Maine while also working with Hockey New Brunswick. He is also the director of goaltending development at Alexander Goaltending, his family’s private coaching firm, where Allen had been going for off-season sessions every year. 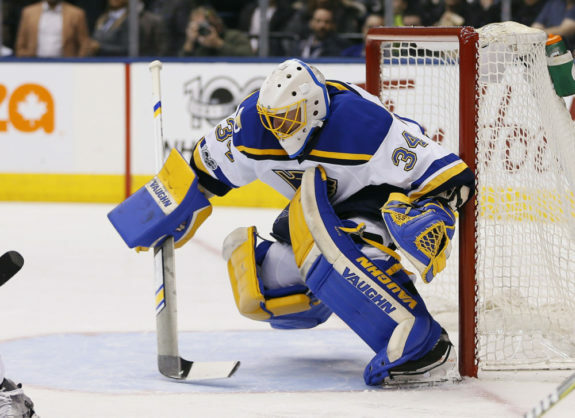 He will have big shoes to fill replacing Martin Brodeur as the Blues goaltenders coach. Brodeur received most of the credit for Allen’s mid-season turnaround last year but Alexander may have had a hand in Allen’s improvements as well. Alexander reportedly beat out former NHL goaltender Fred Brathwaite for the job. Brathwaite coached goalies at the Blues’ prospect camp last summer and was a favorite to be awarded the position. Tkaczuk, Alexander and Steve Ott will be embarking on their first NHL coaching gigs. Ott was a long-time NHL player who became a fan favorite during his time with the Blues from 2013-2016. Ott was hired on May 25. The completed staff now includes 5 of 6 members under the age of 45. Updating age of #stlblues coaching staff after latest hires: Yeo (43), Berube, (51) Sydor (45), Tkaczuk (38), Alexander (35) and Ott (34). Official assignments have not yet been released but we can predict that Sydor is likely to coordinate the penalty kill and work with the defensemen, while Berube runs the power play. Andy Strickland announced via Twitter that Ott will take over Ray Bennett’s press box and scouting duties.